Few outsiders have spent the best part of four decades in the service of the State and even fewer have headed the Judiciary and occasionally acted as Head of State, and performed those duties with distinction. Former Chief Justice Anthony Gates. The term “end of an era” is often over- used yet is a singularly apt description as the nation bids farewell to our most senior judge – Chief Justice Anthony Gates. Few have stood in judgment on the great constitutional, political, civil and criminal cases that have defined the course of our nation and done so with unfailing courtesy, fairness and the judicious application of the law. And certainly no-one else has almost singlehandedly kept the courts open during a period of grave constitutional crisis and prevented the judicial system from grinding to a halt. That is what the Chief Justice did in 2009 when a number of Australian and New Zealand judges withdrew their services in protest at the abrogation of the 1997 Constitution and law societies in both countries prevented others from applying. He simply went over their heads and recruit- ed judges from far-off Sri Lanka – a country where he had lived as a younger man, come to love as much as Fiji and still has a house in which he will spend his retirement years. For his monumental effort to keep the wheels of justice turning, Anthony Gates enters Fijian legal history as someone who faced unprecedented challenges and prevailed. Many regard him as a hero – one of the great Chief Justices – for insisting that whatever the political or constitutional circumstances, the Judiciary has a higher duty to the people to continue providing access to the courts. As well as upholding the right to justice, Anthony Gates has been a great civil activist, taking it upon himself, among other things, to preside over the restoration of Government Buildings – the finest example of colonial architecture in the South Pacific and the home to our Parliament and High Court. So His Lordship has made a highly significant contribution to our national life. And as he steps down from the Bench and removes his horsehair wig and scarlet robe, he carries with him the gratitude and best wishes of a great many Fijians. And especially those whose lives he has touched personally over the years across a broad cross-section of national life. Anthony Harold Cumberland Thomas Gates first came to Fiji in 1977 – seven years after Independence – to work in the office of the Director of Public Prosecutions. He had been born and raised in the Lakes District of Cumbria, north-west England, was educated at Cambridge University and worked as a teacher in Sierra Leone and Sri Lanka before qualifying as a barrister at the Inner Temple and practicing in London. His initial years in Fiji were largely a time of national optimism and progress under the leadership of the nation’s first Prime Minister, Ratu Sir Kamisese Mara. Anthony Gates became the Deputy DPP in 1981 and a Magistrate in 1985. But by the mid-eighties, public confidence in Ratu Mara’s once unquestioned authority had begun to unravel. And victory for what was perceived as an “Indian” dominated Labour government in the 1987 election triggered an upheaval that reverberates to this day. In the name of indigenous nationalism, Sitiveni Rabuka – the current Opposition Leader and then the third highest ranking officer in the military – seized power in two successive coups and abrogated the 1970 Constitution. Anthony Gates was sacked from his job as Magistrate for refusing to swear an oath of allegiance to Rabuka personally and left Fiji for a job in the DPP’s office in Brisbane. He returned to Fiji in 1993 and has been here continuously ever since – first in private practice, then an appointment as High Court judge in 1999 followed by ten years as Chief Justice from the end of 2008. With his long association with Fiji, the man known universally as “CJ” has an intimate knowledge of the events of the past four decades and the complex twists and turns at the apex of national life. They include not only the Rabuka coups, but the Speight-led rebellion and subsequent mutiny in the ranks of the military in 2000 and Frank Bainimarama’s takeover in 2006 that upended the old order and placed Fiji on its present, more stable and prosperous course. Anthony Gates’s career is laced with particular irony in the case of Rabuka – the 1980s coup-maker turned 1990s elected Prime Minister whose recent electoral resurgence now sees him sitting opposite Frank Bainimarama in the Parliament. When Rabuka staged the 1987 coups, he put the then Magistrate Gates out of a job. 31 years later, it was Chief Justice Gates who put Rabuka into a job. On November 12 2018, he paved the way for Rabuka’s dramatic return as alternative Prime Minister when he dismissed the FICAC appeal against Rabuka’s acquittal for corruption that if successful, would have prevented him from contesting the election 48 hours later. And in doing so, enabled Rabuka to get within striking distance of victory. Whatever his personal feelings about the man or the febrile atmosphere in the election lead-up, His Lordship was obliged to put that aside and rule on the evidence before him. And while the government would have clearly preferred a different outcome, the CJ’s parting gesture has been to establish the independence of the judicial process in Fiji once and for all and silence its critics at home and abroad. Having been at the centre of some of the most contentious national events – or witnessed them at first hand – the CJ’s ability to judge them and place them in context is unrivalled. As are his insights into the personalities and behaviour of the principal participants, all of whom he has known. No one but his closest intimates really knows what he thinks of it all. He has always kept his counsel to honour his obligation to maintain his independence and remain above the fray. But it is to be hoped that he uses at least part of his retirement to write those portions of his own story that can be told. Because it would be a fascinating narrative and an important contribution to the story of Fiji. A dignified and dapper figure of stony countenance when dispensing justice, the private Anthony Gates can be quite different – more often than not with a mischievous twinkle in his eye, a ready wit and keen sense of humour. In the manner in which he carries himself, he is the quintessential English gentleman of a type that was once familiar in colonial Fiji yet aside from the CJ, has long since passed into memory. No-one wears the trappings of his office with more authority and panache. In his full regalia, no one more embodies the traditional image of a judge in the British tradition that Fiji has inherited, along with the other Commonwealth jurisdictions. Indeed, it is easy to imagine His Lordship having stepped straight off the London stage as The Learned Judge in Gilbert and Sullivan’s Trial by Jury to take his place on the High Court bench in Suva. Yet his distinctive personal style – the fastidious grooming, well cut suits, muted ties and faint air of discomfort when the dress code is “Bula” – is also matched by gravitas and intellectual substance. Anthony Gates has been a learned judge in the classic sense of the term in that he knows the law – the jurisprudence and the precedents on which it is based – and how that should be applied and court proceedings conducted. He has also consistently set a standard for the judiciary and legal profession of integrity, professionalism and hard work, including the ongoing effort to clear a large backlog of cases that had accumulated before he assumed the top job. Like anyone in public life, Anthony Gates has his detractors. He has disappointed some and enraged others by choosing to serve on the Bench when other judges refused. They alternatively bestowed hero status on him when he upheld the 1997 Constitution after the 2000 rebellion and opprobrium on him for accepting the job of acting Chief Justice after the 2006 takeover. And that opprobrium intensified when after the Constitution was abrogated in 2009 and the judges were sacked, he accepted the substantive position of Chief Justice. It cost him friends in Fiji and abroad and he was dubbed a pariah by some of his fellow professionals and legal affairs commentators, especially in Australia and New Zealand. But for Justice Gates, tuttutting about legal niceties – especially from a distance – was all very well yet secondary to keeping the wheels of justice in Fiji oiled and turning. He chose decisively and unapologetically to place what he saw as his more important duty to keep the courts open and functioning above purist interpretations of the law. 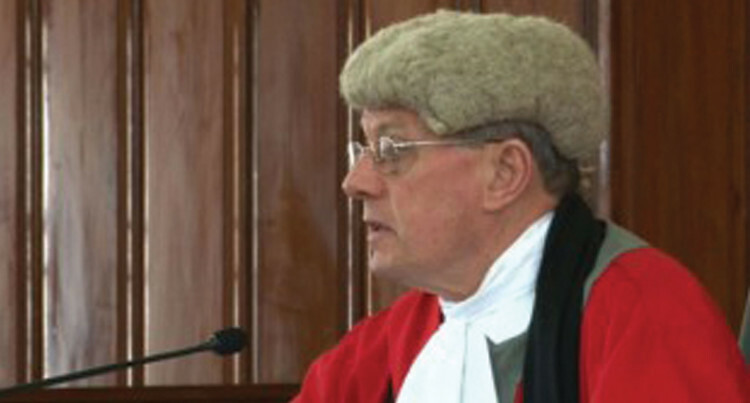 And whatever other judges and lawyers might have thought about that choice, he succeeded in maintaining access to justice for the Fijian people – ordinary citizens who had been robbed or assaulted, women who had been raped, children who had been molested or companies in contractual disputes or subject to fraud or embezzlement. Had the boycott of the judiciary at that time succeeded, there’s little doubt that access to the courts in both criminal and civil cases would have been suspended or severely restricted. And that was something Anthony Gates was not prepared to countenance. So when some of his fellow judges from Australia, New Zealand and the UK either left Fiji or declined to serve, the CJ turned to his second homeland, Sri Lanka, and began a process of judicial recruitment that continues to this day. This too is not without its critics. Yet while imported Sri Lankan judges may have lacked local knowledge, they came from the same British legal tradition and Commonwealth jurisdiction. And in the CJ’s view, they would learn. At one stage – as part of Australian and New Zealand sanctions against Fiji aimed at bringing the Bainimarama order to its knees – prospective judicial recruits from Sri Lanka were approached and warned that they would be banned from entering both countries if they took up their appointments. It was an unconscionable attempt to undermine the judicial process in Fiji and deny ordinary people access to justice. But the CJ was undeterred and so were many of his Sri Lankan recruits, who made considerable personal sacrifices to face down this intimidation and make their way to Fiji anyway. While maintaining access to justice during the early years of the Bainimarama revolution is undoubtedly Anthony Gate’s greatest achievement, the law is not the limit of his accomplishments. He is a man who is knowledgeable and widely read on a broad range of other subjects, with an especially keen interest in history. And he also has a great respect for the traditions of the Judiciary and the Bar, however arcane some may seem to outsiders. state and foreign diplomats are occasionally invited – have been highly prized. They are “black tie” events and include official toasts “to His Excellency the President” and “to Fiji”, invariably amusing after dinner speeches and the traditional passing of the port. Everything at these dinners is said to be immaculately executed, befitting a man with the refined tastes of his generation and background, which includes a large personal library and a fine collection of antiques. Yet the CJ is far from being what the British call a “toff ” – unapproachable and aloof. A great many of his fellow judges and lawyers hold him in the highest esteem and affection for his accessibility and generosity of spirit in having mentored them in their own positions. Anyone who has heard his speeches, especially at admissions ceremonies for those newly admitted to the Bar, will know how much effort he puts into them. They are invariably a combination of historical anecdote and stern admonitions – laced with humour – for young lawyers to maintain the highest standards of propriety and service to the Fijian people. Less well known is the CJ’s work away from the public gaze in the wider community for charity and civic causes. He has had a particular interest in maintaining the beauty and grandeur of Suva. And many a threat to the aesthetics of our capital has been throttled in its infancy by a discreet phone call or quiet word if news of any impending travesty reaches the CJ’s ears. Of course, the architectural philistines have not always been thwarted. But the Grand Old Lady at the centre of our national life will certainly be the poorer for the departure of one of her principal defenders. This role as a civiliser has been one of the CJ’s most important contributions and is exemplified by his role in the restoration of Government Buildings, our most famous landmark. He restored the High Court chambers within the complex and presided over the clean-up of its exterior in which water pressure was used to remove years of mould and grime. The transformation was impressive and the CJ was so proud of it that he invited the Attorney-General, Aiyaz Sayed-Khaiyum, to come and inspect what he had done. Bad move. The AG went away with a covetous eye and persuaded the Prime Minister that after the return to parliamentary rule in the 2014 election, this was where the new Parliament should sit. Not at Veiuto where it had been for many years – interrupted by the 2000 rebellion during which a body had been buried in the garden – but in the old parliamentary chamber in Government Buildings where Sitiveni Rabuka had staged his 1987 coup and where a shot had been fired into the ceiling. The imagery was exquisite – history coming full circle – and the CJ took the requisition of his masterpiece and the need to relocate some of his staff with characteristic good grace. He also threw himself into the task – with the assistance of a fellow Briton, Robin Palmer – of restoring the clock above the Government Buildings tower that had been installed in 1939 but hadn’t worked for a generation. In this they were assisted by an extraordinary coincidence. They discovered that not only was the company that had built it – the Cumbria Clock Company – still in business 74 years on but that its factory was in “Gates country”, no more than 20 kilometers from where the CJ’s family had lived. It has taken a great deal of time and effort and many setbacks for the CJ and Robin Palmer to achieve their dream of restoring the clock and especially the more difficult task of restoring its chimes, that those of my vintage in Fiji hadn’t heard since the 1970s. But they did it. And having had the honour of helping to promote the project in these columns six years ago, I admit to being gripped by a wave of emotion when I first heard those chimes ring out again – a sound in my mind’s ear from my childhood that like the old RNZAF Sunderland flying boats roaring into Laucala Bay – brought so many memories flooding back; chimes also ringing out the end of the lost years in Fiji. Like the nation itself, the clock is still being fine-tuned. But we owe a great deal to the CJ for his role in reviving something that is so much more than a mechanical timepiece. Because it is a symbol above our Parliament that Fijians work best when our unity is in good repair and we are steadily moving forward together across the face of time. So next time you pass by Government Buildings and look up at the clock, spare a thought for Anthony Gates. And remember how – against the odds – he also kept the clocks ticking in our courts during one of the most critical times in our national life. As the hour of his own departure strikes, the nation farewells the CJ and warmly thanks him for his service. Vinaka vakalevu!